Shanghai Pulmonary Hospital is a dream come true for a thoracic surgery aficionado like myself. Twelve operating rooms, a 30 ICU beds, 30 to 40 operations per day and over 40 staff surgeons means that there is always something interesting going on down the hall. Am case presentations is like a review of Robbins’ pathology. Bilateral nodules, ground glass opacity nodules, giant-sized tumors, mediastinal masses of all types and atypical presentations abound. 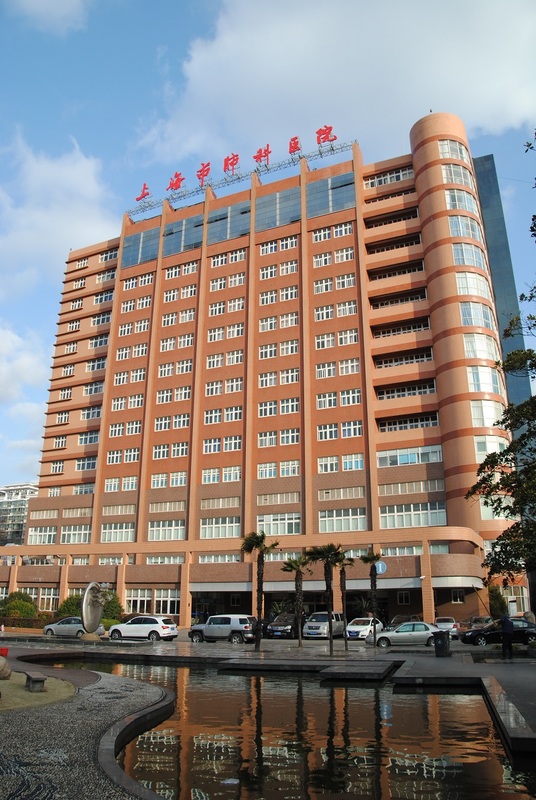 By tradition, all tuberculosis cases must come to the medical complex at Shanghai Pulmonary Hospital because they have a designated tuberculosis hospital on site. Even with other facilities competing for some of the pathology, there is plenty to go around, and I am able to see a couple of lung abscesses as well as several varieties of cavitary lesions. I am sure that there is still a wealth of untapped pathology for me to explore, but I suspect that more interesting infectious cases and occupational diseases are probably confined to the more distant provinces. I briefly talk to one of the surgeons here, who is from Kashdar region, on the far western side of China. Kashdar is located in one of the more mountainous regions of China, which was part of the famous Silk Road trade route explored by the likes of Marco Polo more than half a millennia ago. We discuss the region and compare it to its American counterpart of West Virginia. It’s not a perfect analogy but there are enough similarities to help me for a picture of life, and industry there. That is where the mines are concentrated, and that is where I might find the black lung disease, the silicosis and similar type diseases, though the surgeon I speak with reports that the rates of occupational disease for this occupation to be quite low. Given the dangerousness of underground mining, I wonder if many of the miners worry about living long enough to see a chronic disease like black lung. I don’t know enough about China to ask a lot of the other interesting questions that are swarming in my mind, but I wonder about mesotheliomas and other diseases related to all the heavy industry that forms the backbone of the booming Chinese economy. I wonder about the prevalence of empyemas given the pollution levels and the closeness in which many people are forced to live. It seems like it would be a daily surgical feast, but I don’t know a polite way to ask directions to the hospital with the pus-filled buffet. My hosts also tell me regretfully that they also only see a limited amount of esophageal cancer because many people are misled by the name of the facility, and are unaware that esophagectomies are performed here. One of the surgeons looks so woe-begotten as he tells me this that I know he has the same love of that surgery as I do – that feeling of joy when surgical planning, pre-operative optimization, surgical skill and aggressive post-operative care come together flawlessly for an uncomplicated post-operative course in a complex case. It’s not just satisfaction with a job well-done but pure joy at seeing our patients walk out of the hospital and back to the regular lives. I am here at part of the Uniportal VATS conference with Dr. Diego Gonzalez, but it’s also an opportunity to literally wander the operating rooms at will, listen to case discussions and interview surgeons as I encounter them. I always joke about feeling like a kid in a candy store, now I really am. If I hear a particularly interesting case during am rounds, I am welcome to come into the operating room, watch the case, listen to the discussions and talk to the surgeons. As one of the largest general thoracic surgery departments in the world*, it would be impossible for me to know and present all staff surgeons in the few days that we are here for the Uni-portal Surgery conference. Instead I would like to highlight a just a few of the interesting and talented surgeons at this busy facility. 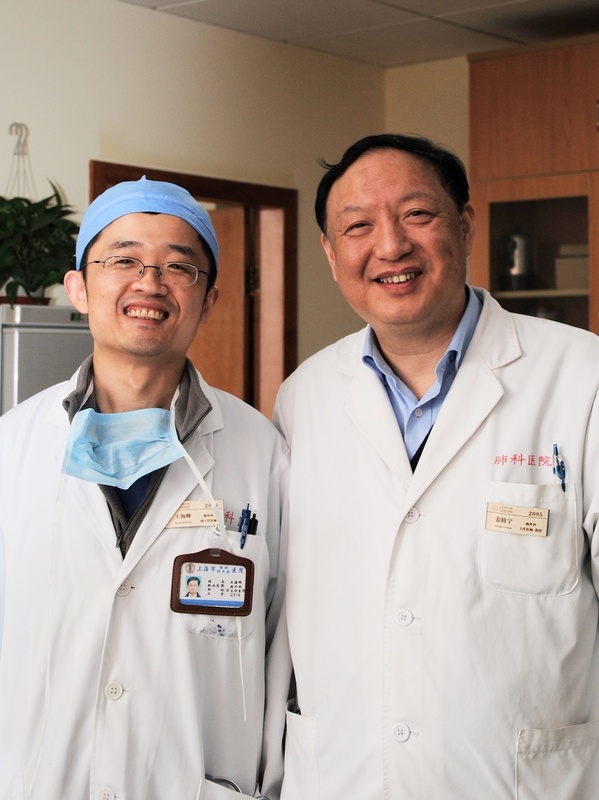 Dr. Jiang is the head of one of the world’s largest thoracic surgery services, but it doesn’t seem to faze him. Then again, he’s been here at Shanghai Pulmonary Hospital (SPH) since he came here to train in 1982. At that time, the thoracic surgery department was just a fraction of the size it is today. As resident, staff surgeon, and then now Chief for the last ten years, Dr. Jiang has seen numerous changes, many of which have occurred in just the last few years. Volumes have dramatically increased, resulting in annual hospital construction to expand the operating rooms. A 16 bed thoracic surgery department has grown to over 250 beds. Dr. Jiang has a strong vision of where his hospital ranks in the world, and where he would like it to be. He sees a strong future for this facility as an international leader in thoracic surgery and clinical research, and he has been working aggressively towards these aims. Dr. Jiang has trained with Dr. Patterson (Bowman Grey, St. Louis) and other leaders in thoracic surgery in Boston and Los Angeles, and he encourages his surgeons to do the same. He strongly supports surgical development among his staff such as bringing leading surgeons like Dr. Diego Gonzalez Rivas to train staff in the most up-to-date procedures. As a surgeon himself, he enjoys the more complex cases, the larger surgeries for the challenges they bring. 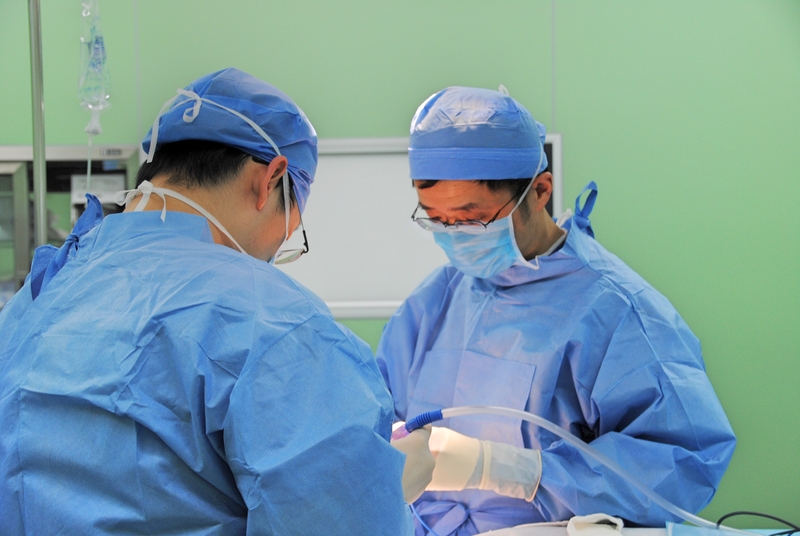 When I mention, ‘chest wall resection,’ he smiles and nods before Dr. Wang can translate. He is also very interested in expanding the lung transplant program but acknowledges that his facility has difficulties in obtaining donors now that China has discontinued the policy of using incarcerated people for organ donation. Organ procurement has been complicated by the traditionally low rates of voluntary donation in Chinese societies. As Dr. Jiang explains, Chinese culture and many Chinese families has a hard time recognizing and reconciling with the concept “brain death” in the absence of physical death. This means that Dr. Jiang and his program are focusing on donation after cardiac death and ex-vivo implantation. But this too is problematic – the scarcity of organs means that despite being in a metropolitan area of almost 30 million, surgeons may have to travel to Beijing or other locations for available organs. Often on arrival, these organs are not in suitable condition for transplantation. Another problem is the reluctance of Chinese insurance companies and third-party payers to cover the cost of ex-vivo support. Dr. Jiang acknowledges that his facility has several large hurdles to overcome if Shanghai Pulmonary Hospital is to become the transplant center for Singapore, Korea and the rest of Asia, as he envisions. I am hoping to find my way into Dr. Jiang’s operating room. I have been advised by the Taiwanese surgeons that Dr. Jiang is widely-known and admired for his ‘nimble fingers’ so I want a chance to see him in action. Dr. HaiFeng Wang is a very nice 41 year old surgeon who assisted in translating during the interview with Dr. Jiang. It was strange, as soon as I started talking to Dr. Wang, it was like we recognized each other. I immediately knew that we would see eye to eye. And so it was, as he presented his daily cases, and we discussed the findings, the planned surgeons and related research. So it seemed natural for me to spend the day with Dr. Wang in the operating room. Like Dr. Jiang, Dr. Wang is from Shanghai. 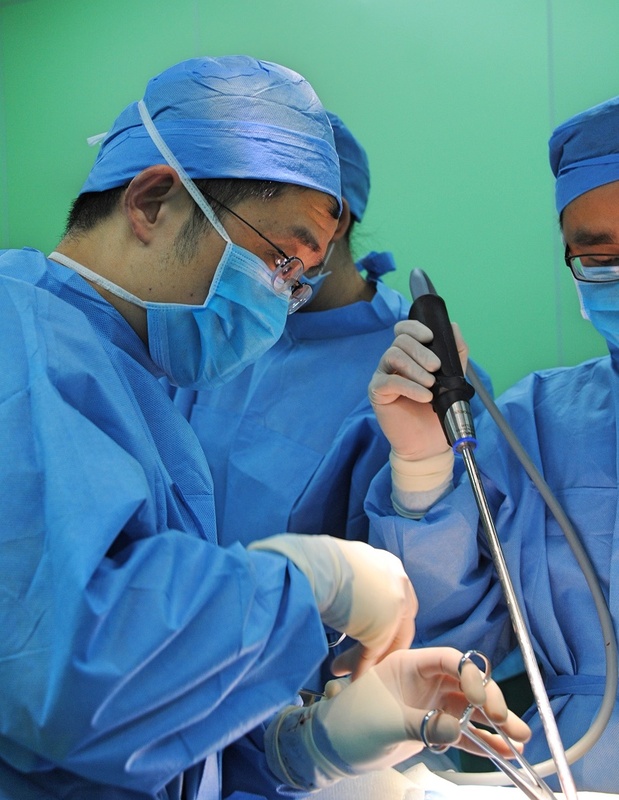 After completing a combined medical school and internship program, (with training in urology), Dr. Wang decided to switch to thoracic surgery (a decision that cirugia de torax wholeheartedly supports). After receiving the World Health Organization fellowship, he traveled to Australia to train with Dr. Peter Clarke at Austin Hospital in Victoria. He focused his studies on the surgical control of cancer. More recently, in 2013, he received the Graham fellowship (from AATS) to study with Dr. Mathisen in Boston, Massachusetts. He also spent one month with Dr. McKenna in Los Angeles and another month with Dr. Patterson in St. Louis. His areas of interest include minimally invasive surgery, tracheal surgery, lung transplantation and the diagnosis and treatment of ground glass opacities. HIs first surgery of the day is an asymptomatic middle-aged patient with an incidental finding of a large bronchiogenic cyst in the right middle lobe. On the CT scan, it looks like an egg-yolk with solid material within a fluid-based cyst. The initial suspicion is a possible aspergilloma but this presumptive diagnosis is eliminated during surgery based on tumor appearance. Frozen section is requested intra-operatively but the results of that only deepen the mystery when a diagnosis of a possible sarcoma is suggested by the pathologist. The resection is completed quickly, but the mysterious aspect of the case has me intrigued as we wait for the final pathology. Update: Final pathology completed 3/17/2015. The report says pulmonary lymphangioma, a rare disease in the lung, and the pathologist says that the cyst itself is actually the lymphangioma, not only the small nodules we see inside the cyst wall. 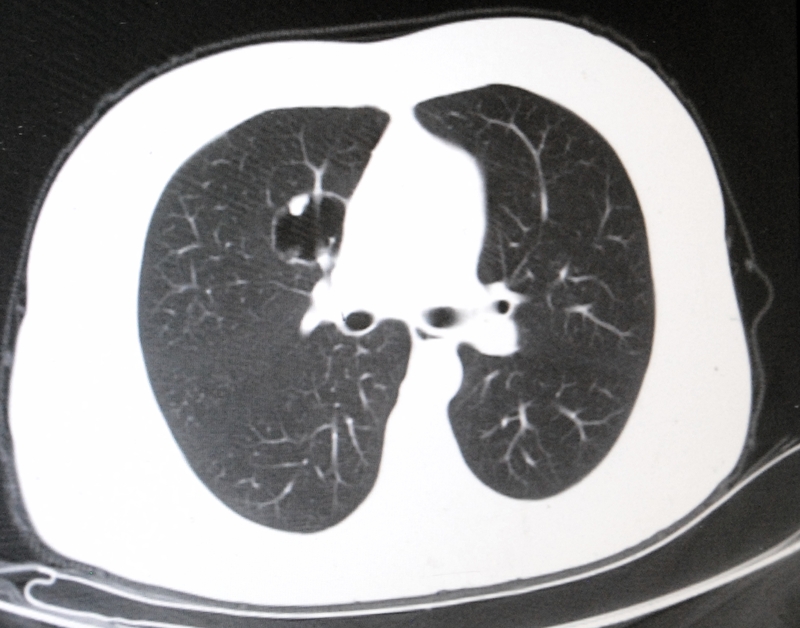 The second case is a young patient with a GGO (ground glass opacity) in the right upper lobe. A needle biopsy confirms that the mass is a malignancy, an adenocarcinoma. This surgery is also smooth and uneventful. There is a third case still scheduled, (and interesting too!) but unfortunately, it’s time for me to race back to the hotel, do some writing before I go to sleep to get ready to do this all over again. I’ll be here in China for three weeks, so this isn’t the last you will hear about Thoracic surgery in China or Shanghai Pulmonary Hospital. In China, a CT scan is a fairly affordable diagnostic tool ($40) for most middle class Chinese citizens. Healthcare among certain classes, is also consumerized to a degree that the United States is only beginning to approach. This means that many Chinese residents have CT scans with the same gravitas that a many of us may approach a new hairstyle, or similar type purchase. * noncardiac. There may be larger combined CTS departments. Note: this article has been edited for corrections due to translational and other inaccuracies. I am a thoracic surgeon from Saudi Arabia. I was informed that you have training courses in Uniportal VATS. I would like to join such training. I met Dr. RAVIS in Saudi Arabia recently and he recommended your center. dear mr yasser, i am thoracic surgeon from pakistan .can u guide me how to get myself registered for july course of uniportal vats at shahngai pulmonary hosp. I have forwarded your information to Dr. Timothy Young at Shanghai Pulmonary Hospital. I would also like you to consider applying for ourinternational VATS award for an opportunity to train with some of the masters of thoracic surgery including Dr. Diego Gonzalez Rivas at the VATS International course this October. Information can be found on this website. thanks Kristin. Could you send me mail of Dr timothy young. i want to apply/register for the VATS uniportal course. i am a surgical oncologist based in India. I can provide you with the names of well-known lung transplantation programs outside of Pakistan, in places such as the United States, if that would help. Unfortunately, I am not otherwise able to facilitate the process. I am an anesthesiologist. From jordan. I am not sure who to refer you to with your request. Let me ask next week at the International VATS conference. 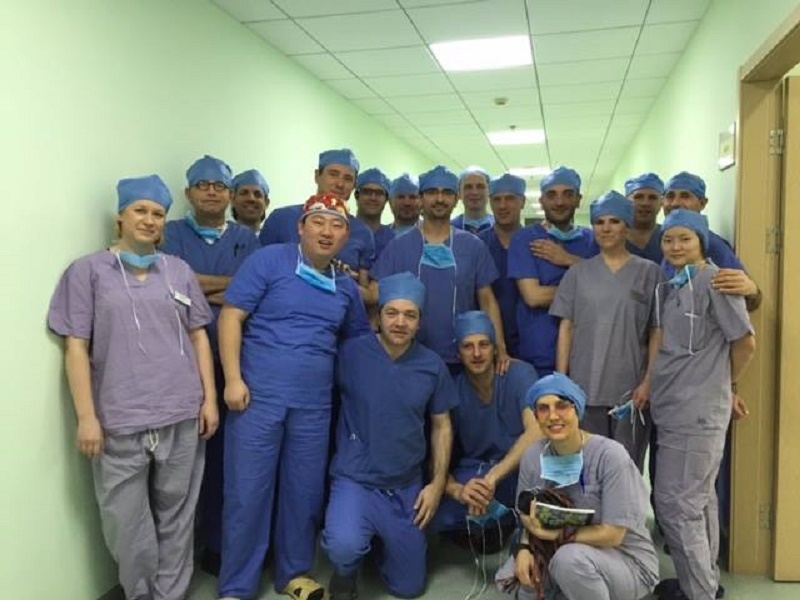 I am oncologist, thoracic surgeon from Ukraine. I would like to attend uniportalVATS courses. I’ve mailed to Dr.Young (emperor1007@163.com) but he didn’t answer. So, could you please advise how to apply/register for the VATS uniportal course. Hi. Are there any english speaking doctors in this hospital? Yes, the majority of surgeons speak English. Hello! I am a thoracic surgeon from Russia. Can I get training course of uniportal vats?